Even though not many knew Nollywood actor, Henry Onyeka, yet the few that have met and worked with him are currently jubilating for the cool dude. It would be recalled that Henry was mistaking hit by a soldier’s bullet on his way to Jos inside a car and since then, his life has never remained the same. 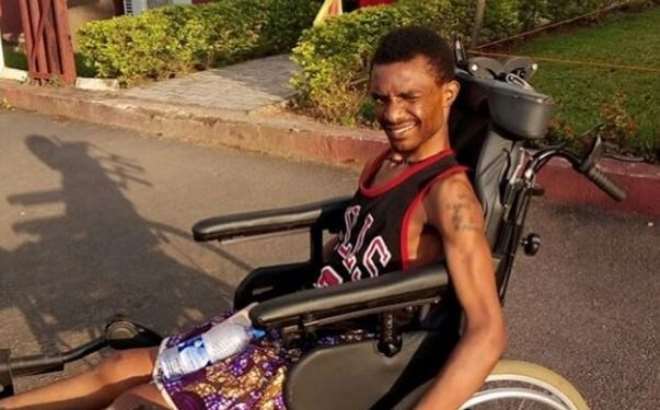 Henry has not been able to sit for several months as he even went out of his way to beg Nigerians for help to be able to complete his surgery. Glory be to God all the same that the likes of Nollywood producer, Ikenna Best along with some other well-meaning persons took up the pain to run around for him and today the five major surgeries is not just successful but he can now sit down though using wheel chair. Ikenna Best begged Nigerians to keep sending in their donations to ensure that Henry is able to use his legs again to walk so as to give him hope again through life.